As someone mentioned after the compo, in your releases, one can see that you care. 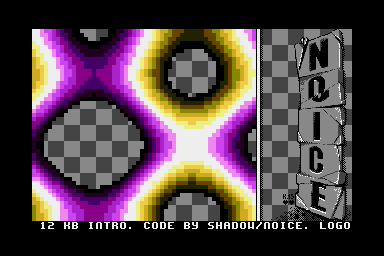 Super 16kb intro, love the way this is presented! Somewhat simple but still totally works for me. Nice graphics, superb tune and nicely presented effect. Neat exploration of a single effect. Feels like a good 8-bit prod, and that is meant as a compliment! I would like to say that this demo works also on ATARI TT and ATARI Falcon. Really nice! That transparent plasma feels very novel on the ST and the tune is amazing! Pretty good for a variation on a theme. Nice idea about bg checker and good choice of colors. Nice logo also. Some simple 3D object somwhere would have made this a must imho. But good. Short, sweet and uplifting. Thanks for this this Shadow!